Sometimes when the news seems impossible to bear, as it has these past few weeks with the tragedy in Boston and suffering in Syria, I turn back to the past to escape the dreadful present times. Of course, the past isn’t any better than today, but at least the pain of those days has passed and people survived despite all their troubles. One of my favorite periods of the past is the 18th century, when manners were formal and civility masked much of the cruelty of the times. 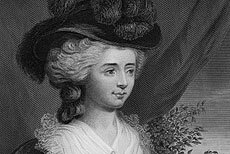 One of my favorite people of the 18th century is Fanny Burney, a woman born in 1752, who was considered so dull and backward by her family that she was never educated at all. The Burney children grew up in a busy household because their father was a popular music teacher and had many students from the London’s society world. Her brothers and sisters were given tutors or sent to school, but poor Fanny grew up a silent watcher of what went on in the world around her. When she was eight years old she still could not read and no one noticed how or when she finally caught on to how to do it. But reading led to writing and eventually Fanny was able to use her hours of quiet observation to write a series of novels that expertly caught the social life of the times. Despite her fears, she was thrilled when she was told by friends and relatives that they had discovered a remarkable new book. She was pleased to listen to an aunt read the book to her invalid brother and laughed to think they had decided it must be the work of a man. Soon enough however, her family and others learned who the true author was and Fanny Burney was launched on a new and illustrious career as one of England’s most popular authors. Jane Austen loved her books and was influenced by her success. The quiet girl became a favorite in society; she served as a lady-in-waiting for Queen Charlotte. Then, in a development worthy of her own books, she married happily and had a son. She suffered many of the trials that have become familiar in modern life, including breast cancer, but she survived. Best of all, her novels and diaries are still readable and available in most libraries as well as incredibly inexpensively online. 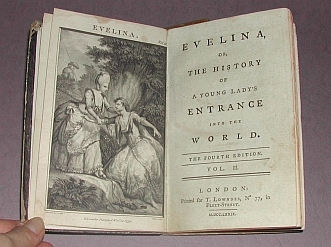 In fact I’m going to search out my Kindle and read my 99-cent version of Evelina. I’ll write more about Fanny next time.